I recently spent six days away, in the Saskatoon, Saskatchewan area, speaking at a women’s retreat, and while there anyway, enjoying a visit with two of my sisters and their families, as well as launching my new book at Saskatoon’s McNally Robinsons. The retreat was the main thing, of course, some 45 in attendance from Mennonite Church Saskatchewan considering the theme “Called to Rest, Called to Renewal.” And such wonderful women they were, blessing me with their warmth, participation, and conversation. But I’m finding that the piece of Away that seems to hook the most curiosity when I’m asked about it — and answer — is the fact that I took the train to and from. It’s understandable, I suppose; I hadn’t been on a Canadian train myself for at least 25 years. So, today I’m blogging about riding the train. Since I got a “last minute,” hence greatly reduced fare, and being a passenger is decidedly less stressful than driving a long day on my own, taking the train turned out to be an economical, convenient, and fun way to get there and back. Nostalgic too. The train sways more than I’d remembered, but the seats are roomier and recline further than airplane seats, and neither trip was overly crowded. In addition, there are ample options to move around and also sit in the games/reading or dome cars. This nowadays travelling by train business struck me as oddly unassuming, though, even self-effacing, perhaps because the Via Rail carrying people yields to trains carrying freight. And when we had to wait three hours past our scheduled eastbound departure in Saskatoon, not once did anyone or anything resembling an official explain or apologize or tell jokes or play games with us. Westjet of the Rails it certainly is not! Taking dinner in the dining car, however, provided a touch of elegance as well as an excellent meal, and then, for a while, I suppose, we could imagine we were high priority. The prairie landscape at this time of the year is monotonous and the two days of my travel were overcast. In the dome car, however, where the scenery-keeners sit, I listened in on the conversation of some people from Elsewhere who were fascinated by and busy photographing every little thing, it seemed, from abandoned buildings sagging in fields to junk trucks languishing in farm yards to a skunk to herds of cows. It reminded me how superficially I often observe, especially in a familiar environment. But even I noticed that the Qu’Appelle Valley through which we rolled and swayed for a good long time is beautiful indeed, even in its pre-winter browns. And what did I do on the train, besides eavesdrop? I read. A marvellous gift, really, two whole days to ride and read. Going, it was Faith Johnston’s newly launched novel, The Only Man in the World, a lovely book about the complications and joys of family life and love. This week’s review of the book in the Winnipeg Free Press said, “For readers who prefer the destination to the travel…this book will likely not suffice. But for those for whom the journey itself is a thing of joy, The Only Man in the World will satisfy at the moment of reading and will linger long afterward.” Well, I do like the journey, and being literally in the midst of one, it was a double joy. 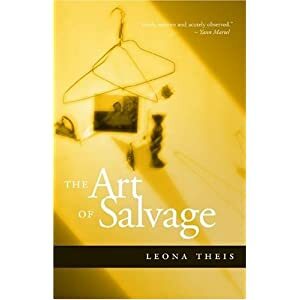 Returning, it was Leona Theis’ The Art of Salvage, a daughter-mother story filled with pain and yearning, because the daughter grew up considering the woman who was her birth mother her sister instead. Theis’s descriptions of various emotional states and the novel’s Saskatoon setting are compelling. Here my double pleasure was reading about the trails and railway bridge I’d walked with my (actual) sisters just two days earlier. P.S. Speaking of books and reviews, I’m delighted at What You Get at Home’s first review — thumbs up from the Winnipeg Free Press! This entry was posted in Books, Personal and tagged Dora Dueck, Faith Johnston, Leona Theis, riding the train, Via Rail, What You Get at Home by doradueck. Bookmark the permalink. Thanks, Dora. Having been in Europe earlier this year and seen how normal train travel is, your post makes me wish Canadians, en masse, could latch on to train travel as a healthier, cleaner option, than flying. Ditto your wish, Byron! I suppose, here, that it’s the distances we factor and also the commodity of time, a higher value for us than many other values. Hardy and I had a train experience recently after a long time away from trains. We were travelling from Kiev to Zaporozhye overnight. We had sleepers and a little table between the bunk beds. It wasn’t luxury, and it brought to mind the train trip our family took as refugees from Ukraine to Poland. We didn’t have sleepers, or little tables, we sat on our luggage or on straw on the floor. However, I was a tiny baby (3 mths. old) and I’m sure my mother clutched me to her breast the whole time. Others of our tour group said they hadn’t slept well at night, but I slept like a baby. The rocking of the train was so comforting, it must have involuntarily brought that feeling of being rocked and held back! Memory is a strange and uncontrollable thing! “Memory is a strange and uncontrollable thing.” Yes. And bringing you, in this case, that comforting feeling of being held and rocked. Thanks! I can identify with this post. Dave and I recently took the train from Winnipeg to Toronto to visit his family and then on to New York to see our son perform there and visit our Hong Kong students. We too got a ‘sweet’ deal on our tickets and driving to Toronto in our car would have been more expensive than the train especially if you consider the cost of sleeping accomodations and meals which were included in our train tickets. Our inspiration for choosing to travel by train rather than by plane was our train trip through Ukraine. We made six train trips in Ukraine as we visited various cities and like Elfrieda I slept like a baby. What I enjoy most about train travel are the interesting people we meet. Trains seem to provide more time for introductions and conversation. Thanks, MaryLou, interesting to hear about your recent train travel. Maybe, as Byron noted, we can get something going here! I agree about the people-meeting part. At dinner, I was seated with three other solo travellers, and voila, three interesting people/stories and interesting conversation. I’ve done that Saskatoon-Winnipeg trip by train several times over the past few years, both with my family and alone, and I love it. It’s partly the landscape (the Qu’Appelle Valley especially), but also the freedom to spend several hours just reading and musing. Yes, there’s really nothing to do but that and it’s such a wonderful space to be in. — Want to do the same trip in summer, see the Qu’Appelle Valley green too!